I hold a special place in my have for parents who have lost a child. Having lost 5 babies to miscarriage, and having one sister who was stillborn, I have been try to help other mothers’ deal with those feelings. I started a ministry last year that donates preemie blankets to hospitals. They can give those blankets to mothers who will leave the hospital with nothing but empty arms. 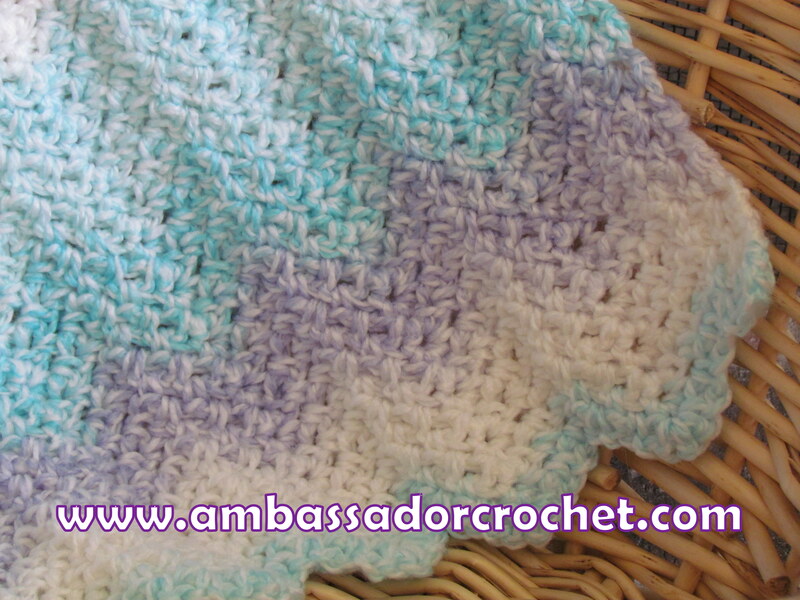 Here is a preemie afghan pattern I designed. Feel free to use it for any donation that will bring someone comfort. If you’re looking to donate to Wrapped In Love, you can use the contact button to contact me, or click the picture. The site will give you all the info there. Sweet Dreams – 2.5 oz. Row 1: working in back ridges of beg ch, 2sc in 2nd ch from hook, (ch1, skip next ch, sc in next ch) 2 times, skip next 2 chs, (sc in next ch, ch1, skip next ch) 2 times, * 3sc in next ch, (ch1, skip next ch, sc in next ch) 2 times, skip next 2 chs, (sc in next ch, ch1, skip next ch) 2 times, repeat from * across to last ch, 2sc in last ch, turn. Row 2 – 50: ch1, sc in 1st sc, (ch1, sc in next ch1 sp) 2 times, skip next 2 sc, (sc in next ch1 sp, ch1) 2 times, * skip next sc, 3sc in next sc, (ch1, sc in next ch1 sp) 2 times, skip next 2 sc, (sc in next ch1 sp, ch1) 2 times, rep from * across, sc in last sc, turn. Thank you for the pattern for this beautiful blanket. I know that sometime in my life, I will have a use for it. Blessings to you.. Thank you so much for this beautiful pattern! I cannot even begin to imagine the magnitude of loss a mother feels after a miscarriage or still birth. I had difficulty in conceiving and would have been devastated if either of my pregnancies were lost. Anything we can do to ease that pain is an amazing accomplishment! I can’t wait to make some blankets up for our local children’s hospital. Thank you again! When I first started crocheting I was involved with a ministry that made blankets for new moms and baby booties for those who suffered a loss. I will keep this in mind for upcoming donations. Thank you. I’m so glad you are helping! I thank you for doing this!! My son was born at 20weeks and was 15oz, the hosp said that he was not 16oz so they could not help him (thank goodness they no longer practice this 11years later) he lived for 33mins on his own in our arms. They had cleaned him up & wrapped him in a blanket crocheted by someone like you and in a pretty hat. After he passed his blanket, booties & other items was placed in a heart shaped box for us to keep. To this day it still smells like him and I get it out a few times a year to just feel him close again. This is a blessing I could never put into words & I know other moms and dads feel the same way. Thankfully we had another boy 4 years later (on the exact same date I must say), he was 20weeks & 5 days gestation, 1lb and 10in long. He is now 7 and doing amazing, you would never know he fought so hard for his life. He is the youngest gestation to survive and paved the way for so many other little babies to survive from what his drs have told us, they use his story as a guid for others. We are so blessed to have this little guy & to have people like you who give a great gift to families. I to have a fund for NICU items & we aim to build houses for the parents of NICU babies to stay in with out being turned away. Thank you again for what you do, all of you have make items for moms like me. Is it ok if I share your site and pattern on a crochet group also? Absolutely, Heather! I have more preemie patterns in the works too. II. lost my first child 38 yrs ago.and not a day goes by that I don’t think of him.I named him Jason.he was born at bread25 weeks and weighed 2.7 lbs I nameever got to hold him. He waas buried 4 days later. I wish there were places then that there is now.behave made something with love for my son. II have been crochet n knitting for over 50 yrs.I would love to be able to give a part of my heart in what I make to those in grief. Ty for sharing with me and God Bless. Dee, I’m so sorry for your loss. I pray that helping others will also bring peace to you. Hi Jennifer, I used aran (worsted) weight yarn. I hope that helps. The yarn label info says it was 2 ply, but it was very thin for #4 yarn. I would say if you’re trying to match it by ply go with a 4-ply. Just make sure it’s 4 sts per inch for the gauge and you should be fine. That would be wonderful! I would love to see pics. Just using granny squares but came up pretty in pink, hats are my adaption of a free pattern found a while ago which i vary to create very small, medium and right size according to the pattern. Takes about 30 minutes so take them with me to do when driving to and from y daughters, saves looking at the traffic that my husband yells at :) cant work out how to add the photo to this section so will send to the email address. so glad you like the rug and hats, love making them. I am going to make the 18” doll blanket. My question is do you work in the back ridges only on row 1 or the entire blanket? That’s just for row 1. It will create a finished edge so you don’t have to add a border. I believe you would need to increase in multiples of 11 stitches. Let me know if that doesn’t work and I’ll try to redo the math again.